Copic Multiliner Pens are fine quality inking pens available in a variety of sizes and styles. The pigment-based ink is waterproof and won't bleed or smear when used with Copic Markers. These quick-drying pens are ideal for anime, illustration, cartooning, pen-and-ink drawing, scrapbooking, and other detail work. Copic's polyester nibs won't roll or bend, and they're housed in a durable plastic case with "click fit" caps that prevent dryout. They're great for use as a complement to Copic Sketch Markers. Copic Multiliner Pens are available in a variety of nib widths, from 0.03 mm to 1.0 mm, as well as Brush Small (BS) and Brush Medium (BM). 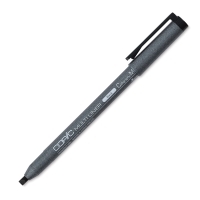 Copic Multiliner Calligraphy Pens have a crisp, straight edge with a narrow cross-section for making well-defined lines. Perfect for hand lettering and calligraphy, their richly pigmented black ink is great for dynamic writing both broad and narrow. Available in 2 mm (CS) and 4 mm (CM) sizes. Set of 4 Broad Nib Black — Includes four Black Broad Nib Multiliner pens, one each of 0.5 mm, 0.8 mm, Brush Small, and Brush Medium. Set of 4 Fine Nib Black — Includes four Black Fine Nib Multiliner pens, one each of 0.03, mm 0.05 mm, 0.1 mm, and 0.3 mm. Set of 4 Fine Nib Gray — Includes four Cool Gray Fine Nib Multiliner pens, one each of 0.05 mm, 0.1 mm, 0.3 mm, and 0.5 mm. Set of 4 Fine Nib Lavender — Includes four Lavender Fine Nib Multiliner pens, one each of 0.05 mm, 0.1 mm, 0.3 mm, and 0.5 mm. Set of 4 Fine Nib Sepia — Includes four Sepia Fine Nib Multiliner pens, one each of 0.05 mm, 0.1 mm, 0.3 mm, and 0.5 mm. Set of 7 Pens — Includes one Black pen in each of seven standard sizes: 0.03 mm, 0.05 mm, 0.1 mm, 0.3 mm, 0.5 mm, 0.8 mm, and 1.0 mm. Set of 9 Pens — Includes the same sizes as the Set of 7, plus one Brush Small and one Brush Medium.